On February 17th, someone at JFK Tower had their child with them, and subsequently let the child issue instructions to aircraft. (The instructions were takeoff clearances and then handoffs from JFK Tower to the New York TRACON controller, not issuance of any radar vectors or changes in assigned altitude.) As you can hear in the audio clip below, pilots communicating with the child seemed to take in it a humourous spirit, but that was evidently not the case with the FAA, which has suspended those involved from ATC duties pending the outcome of an investigation. The destination and enroute routing of your flight will determine which transition your aircraft flies, but as you can see, the routes are not random, they are well-defined. The SID is assigned while the aircraft is still on the ground, so the pilots have ample time to look it up and familiarise themselves with it. The runways in use will also be obvious (via automated ATIS, listening in on TWR’s freq, or simply asking the clearance delivery controller while he’s examining your flight plan). By the time of your handoff from tower to the departure controller, where you are headed and how you will get there is no great mystery. Aside from the violation of federal aviation regulations—no small matter, to be sure—my only (minor) beef is that the kid’s handoff call didn’t include the next facility’s full name and frequency. It should have been something like “JetBlue 171, contact New York Departure on one-three-five decimal niner, good day.” Still, for an amateur, it was a fairly creditable job. As highly regimented a creature as aviation is, it is still staffed and run by human beings, with all of the virtues and foibles that entails. In my younger days (pre-September 11th), I had dated a woman whose father was a very senior controller at Nav Canada. When the young lady flew from CYYZ to various destinations abroad, she would inevitably get called to the cockpit to chat with the controllers on duty—friends of the family—who had known her from the time she was a child. If there were delays in departing, these controllers would subsequently prioritise her flight’s departure above all others (excepting medevacs), which was no doubt a pleasant surprise to the captain of said aircraft. We live in a human world, and humans—by nature—are going to deviate from the script every now and then. Determining the difference between harmless and harmful deviations is not always easy (especially when inflexible bureaucracies become involved), and one hopes the controller and supervisor at the heart of the matter don’t lose their jobs over this. 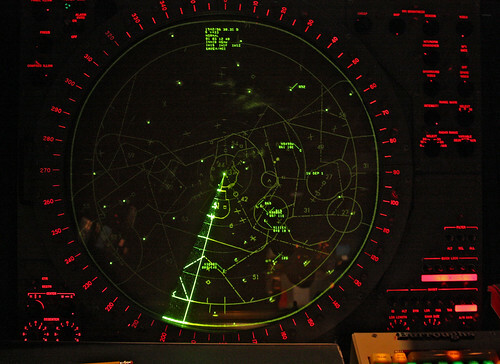 RELATED: Ars Technica has a terrific article on the science and technology of air traffic control. ALSO RELATED: Kent Wien, Gadling.com’s resident 757/767 driver, notes that this is why IFR flights require detailed readback of instructions, so that there is no mistake about what the aircraft is expected to do in the airspace. The pilots departing JFK did read back the kid’s instructions, and those instructions were not incorrect, otherwise a duly-qualified controller (i.e., the tyke’s dad, or the tower supervisor) would have leaped in and corrected it. Airport Arrival, originally uploaded by The Fang. AFSOC teams arrived at Toussaint L’Ouverture International Airport (MTPP) on Wednesday night and began the process of bringing order out of chaos at Port-au-Prince’s primary airfield. Elements of the 23d Special Tactics Squadron (23 STS) and 720th Special Tactics Group (720 STG) are providing air traffic control and airfield services, medical support, and weather observation/forecasting. (More information available via yesterday’s DoDLive Bloggers Roundtable interview (embedded below) with Lt. Col. Brett Nelson (USAF), 23 STS Commander and Maj. Jason Daniels (USAF), director of operations for the 720th Operations Support Squadron. The airport is open 24 hours; airfield lighting is operational and USAF brought additional portable lighting as well. Traffic flow at the airport is constrained primarily by ramp space and fueling equipment. There are only 12 ramp spaces, 2 fuel trucks and 2 tow bars. One foreign aircraft (identified as Chinese in other reports) required 6 hours to refuel, which is considered a significant delay. Peak capacity seemed to have been when there were 44 aircraft on the ground; the more aircraft there are crowding into the small ramp, the harder it is to download cargo and upload evacuees. USAF is working with the FAA to try to prioritise air traffic and try to get the most urgent cargo and equipment to the airfield at the time they are needed. Due to the limited logistics capability at the airfield, USAF would prefer that aircraft arriving at Port-au-Prince have enough fuel to depart again. Status of the petro tank farm is not known. USAF looked at using an additional airfield (Cap-Haitien International Airport, MTCH) to facilitate traffic flow, but determined that its potential throughput is “not that significant”. RELATED: CNN producer Larry Shaughnessy was present on the call and has penned a pretty good summation of the effort at MTPP. 365 Days – Day 63, originally uploaded by konrad_photography. “With no radar available, the radio system was the only way of knowing their position,” said a senior air traffic control officer, refusing to be identified, about the situation in the tower. The radar shows to air traffic control the exact coordinates of planes in the air, or those waiting to take off, their altitude, their speed and the distance between them — it can get bumper-to-bumper up there. Air control switched to something called a “manual” process: traffic controllers obtain the position of each plane from its pilot on radio, put it down on a chit of paper and stick it to a scrabble kind of a board. “We knew the exact position of the aircraft and had to segregate them further so they stay away from each other,” said the traffic control officer, admitting a small human error or an oversight could have proved disastrous. — “Airport radar crash: 60 mins on brink of disaster.” Hindustan Times, 14 January 2010. Needless to say, nothing went horribly, fatally wrong or you’d be seeing it on the news this morning. The procedures for dealing with communications or radar failure are well-known and part of pilot and ATC training. The Hindustan Times is sort of overselling the risk factor, given that 1) Delhi was able to switch seamlessly from the old, crashed Raytheon AutoTrack II system to the brand-new AutoTrack III, which was conveniently already installed and being-shadow-trialled for six months; and 2) most commercial airliners these days fly with their own onboard traffic collision avoidance systems (TCAS). Indian Express has a less breathless and saner account of the goings-on. V Somasundaram, executive director (air traffic management), Airports Authority of India, told Newsline: “The computer system that provides all aircraft-related data to the Delhi ATC failed at 5.44 pm on Thursday. The system was rebooted and put in place by 7.30 pm. But the controller used other channels of communication with pilots and aircraft in this period. — Gupta, Geeta. “Software crash grounds IGI for 2 hrs.” Indian Express, 15 january 2010. When a major disaster occurs, the world rightly leaps to respond as fast as possible. Owing to their speed, aircraft are usually designated to carry in the first wave of relief supplies and personnel, with the much greater capacity of sealift following up in the days afterward. For example, Canada has sent strat- and tac-lifters full of relief supplies, light utility helicopters and personnel to beleaguered Haiti. But what happens when local air traffic control services are also out of action? 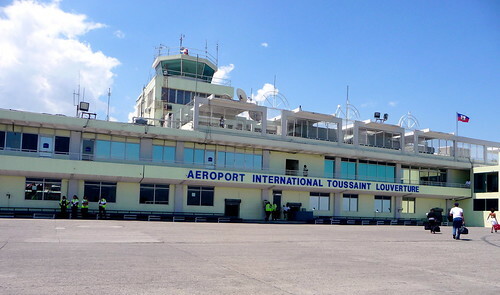 The earthquake that devastated Haiti also rendered its highest-capacity aerodrome (Toussaint L’Ouverture International Airport [MTPP]) unservicable by causing severe damage to its control tower. Aircraft enroute to Haiti were diverted to other airfields within the region, and, as usual, the United States stepped up to conduct the initial damage assessment and air traffic control triage. Initial assessments of damage were made in overflights by a U.S. Navy P-3 Orion. …A member of the U.S. State Dept. Haiti Task Force said the U.S. Coast Guard was operating flights into the airport that were controlled from a USCG cutter operating in the bay outside the city. A U.S. government team was expected to arrive later on Wednesday to begin air traffic control in place of the tower. UPDATE 140100Z JAN 2010: USAF has taken over air traffic control duties with the arrival of AFSOC units—23d Special Tactics Squadron (23 STS), 720th Special Tactics Group (720 STG). They are focusing on ATC and airfield services, medical support, and weather observation/forecasting. More details are available through the DoDLive Bloggers Roundtable recorded yesterday (and embedded below). First published 03 October 2005. But lazy, half-assed reporting was not. Sunday’s Toronto Star had a nice three-page story about the September 2nd incident involving Air France 358 (web version here). As citizens of this city are no doubt aware, the A340-313X arrived at Toronto Pearson’s Runway 24L in the midst of a severe thunderstorm. The aircraft did not touch down until almost halfway down the 9,000ft runway, and it did not manage to stop, but ran off the end of the runway and went careening down into the Etobicoke Creek ravine. The plane caught fire and the composite-based fuselage was almost completely destroyed, although no passengers were killed. The Star leads off its coverage with a splashy front-page colour photo of the burning aircraft, with the bold headline “THIS COULD HAVE BEEN AVOIDED: An exclusive investigative report into this summer’s Air France crash at Pearson“. CTV News also summarized the story in their web edition here. Naturally, I was eager to see what Star reporters Scott Simmie, Kevin McGran and Catherine Porter had to say about it. I thought I was going to hear interesting anecdotes from current A340 pilots, runway design enhancements from GTAA staff, a discussion of the typical decision tree when flying in severe weather, and speculation on what might have occurred in the cockpit during the event itself. What I got instead was at least one full page devoted to the detailed story of two particular passengers, some idle speculation from lawyers handling the class action suit, quotes from exactly two pilots, four specific recommendations for field improvements to the airport, blasé rebuttals from a GTAA official that at least one of the runway improvements may not be effective in winter, and some very, very sloppy reporting. A) Terminal Doppler radar. Doppler radar allows meteorologists to see inside the storm structure and determine where wind shear is likely to occur. This predictive function can be automated, with alerts passed to air traffic controllers when wind shear has been detected (or likelihood of it is very high). ATC would then pass on the warning to inbound aircraft, who would then make decisions about the wisdom of an approach into such conditions. Pearson International does not have its own Doppler radar but instead relies upon the Environment Canada doppler system based in King City, Ontario. While this is a great suggestion and Pearson ought to have its own terminal Doppler radar in any event, it does not take rocket science to predict the occurrence of unsafe wind shear within a thunderstorm. That assumption is routine for GA pilots whose smaller aircraft do not carry their own weather radar. Although large commercial aircraft regularly fly into severe weather conditions, private pilots in smaller aircraft generally do not. Why? Because there are certain life-threatening risks associated with doing so, and you learn that in ground school before they ever let you near your very first prop-driven, piston-engined aircraft. You don’t need Doppler radar to figure out that thunderstorms are inherently dangerous to flight. B) Grooved runway surfaces. Cutting small 6mm grooves, spaced 24-38cm apart, into a runway’s surface can help drain water and prevent hydroplaning. The grooves are perpendicular to the runway’s direction of travel. The FAA requires grooving of concrete and asphalt runway surfaces, but Transport Canada does not. Pearson’s concrete runways were grooved at the ends in the 1970s, but its current asphalt runways are not. Transport Canada believes the grooving technique may be effective in the summertime, but results in increased maintenance and marginal effectiveness during the winter. Note also that TSB lead investigator Real Lavasseur has publicly cast doubt on speculation that hydroplaning was a decisive factor in the AF358 incident. This did not stop the Star’s crack team of reporters from quoting a retired pilot and other experts who speculate that hydroplaning did occur and was in fact a decisive factor in the erosion of AF358’s braking performance. C) Engineered Material Arresting System (EMAS). ICAO recommends a 1000ft overrun area and the end of each runway, but not all airports have enough real estate to accomodate large overrun areas. EMAS mitigates that limiting factor to a degree. It is special, crushable concrete placed at the end of a runway in the overrun area, designed to crush under the weight of an aircraft, but support the weight of emergency vehicles. EMAS slows down an overrunning aircraft rapidly by absorbing the aircraft’s inertia while denying its wheels traction, much like a car trying to drive on loose sand. Airports whose runways end in a body of water have been most of the early adopters for this technology, and it is credited with some impressive saves. Since the EMAS concrete is very porous, the GTAA has questions about its effectiveness in winter. In wintertime, the EMAS concrete is likely to fill with water and freeze, increasing its structural strength slightly and raising its weight threshold. D) Covering over the Etobicoke Creek. Putting any kind of effective overrun area (EMAS or otherwise) on the 06-24 runways would involve covering over a portion of the Etobicoke Creek ravine. What the Star doesn’t mention is that covering the ravine and installing a 1000ft overrun area without EMAS would be a big-ticket Bad Idea, as Highway 401 angles northward west of the runway end. Any aircraft travelling fast enough to have a significant overrun on Rwy 24L may just end up on the 401 westbound collector lanes. If we install any kind of major overrun area on the 06-24s, it has to have some kind of inherent decelerative properties, like EMAS. In the Star‘s world, the installation of these four technical solutions at Pearson International would have saved this flight. And to its credit, the paper’s discussion of the possible field improvements is informative, largely factually accurate and relevant. But these systems (with the exception of Doppler radar) are essentially a last-minute fail-safe. Technical means provide some buffer from bad decisions made in the cockpit, but on their own they are utterly inadequate to prevent future tragedy. For these fail-safe systems to come into play, your flight crew must already have shown questionable judgment and landed under marginal weather conditions… on a very wet runway… without enough room to stop. With all due respect to the Star, air travellers generally want the avoidance of disaster to consist of more than last minute, on-the-ground airport and runway improvements. There is no ground-based system which can definitively prevent errors in judgment. The best flight management systems in the world are up there in the airplane with you, housed inside the skulls of the flight crew. Getting the right information into that grey matter, at the right time, is critical to flight safety and the best way to avoid screwups. If your flight crew makes a series of bad enough calls, even the world’s best weather detection systems and a three-mile runway with a thousand-foot EMAS overrun zone can’t help you. You have to catch each little questionable decision long before they collectively add up to something approaching disaster. This is generally well ahead of the point where the flight crew is staring at the rapidly approaching opposite end of the runway. And what about other safety measures, like distance-to-go markers. In addition to grooving the runway and installing this EMAS overrun zone stuff, wouldn’t it be a whole lot easier and cheaper to give pilots the tools to know what’s left in front of them? Then they can make their own decisions about whether a full stop or touch-and-go is viable. Why make them guess and wait for the concrete embrace of Nanny GTAA’s overrun zone? They are pilots for heaven’s sakes, trained and accustomed to multi-tasking — talking to ATC, maneuvering the aircraft, fiddling with the FMS and avionics all at the same time. They are not your typical poorly-trained civilian driver who can barely manage to safely maneuver his or her commuter vehicle down the highway while talking on a mobile phone. 2) Non-explicit accreditation of the two quoted pilots. Neither were Air France pilots, and neither were credited as being currently or formerly rated to fly the A340. I’m going to excuse the first pilot because he was quoted in context as the head of the Canadian safety branch of the Air Line Pilots Association, and he was speaking about weather detection capabilities at Pearson. Although he only flies regional jets and turboprops, he has additional knowledge and a role dealing with air safety in a professional pilots’ organisation. That’s a reasonable linkage. The second pilot, however, is credited only as being retired from Air Canada, and he was speaking about this particular landing incident. Look, guys, I know you’re just mere reporters but not all pilots are created equal. Different airlines have slightly different operating procedures, even for the same type of aircraft. Not all pilots are qualified to fly every aircraft in the airline’s inventory. Some pilots are captains and some are FOs (first officers). Some have additional training duties, like checkrides and pilot qualification. All of these things have a bearing on the relevance of their commentary to a news story like this. For instance, my own experience in single and twin piston-engine general aviation aircraft does not make me an expert witness in terms of multi-engine turbofan-powered commercial air transports. I know what I know, but more importantly, I know what I don’t know. If you want to know about a particular aircraft’s performance limitations, then talk to someone qualified in that aircraft type, plain and simple. Don’t find the first off-duty guy with a uniform and ask him to comment about flight systems, avionics and procedures he’s not familiar with. What made the retired Air Canada pilot worth talking to? Special training? Involvement in a similar accident? Familiarity with Air France’s training doctrine and procedures? Similar tastes in the choice of neighborhod pub? His kids play with yours in day care? Where does his expertise, aside from being a generic ATP-rated commercial pilot, bear relevance to this incident and your story? Anyone? Anyone? Bueller? The Star mentions the unsourced Figaro story I mention here, and then goes on to say that the twelve-second delay in reverse-thrust deployment may have been “software related”, even though Airbus’ safety circular after the incident noted no software problems. This is the simpleton’s method of saying that all of the thrust reverser interlock conditions (wheel rotation speed, main gear compression, throttle setting, radio altitude) may not have been met. Airbus would not have indicated any software problems because the software is not at fault — even if hydroplaning occurred, no one is going to recommend disabling the interlock criteria for wheel rotation speed — it was operating properly as designed. Disallowing reverse thrust because not all interlock criteria are present is not a fault with the software (which can not detect a hydroplaning condition) — but with the pilots, who are supposed to assess the risk of hydroplaning long before touchdown, and adjust their landing and rollout procedures accordingly. * What’s really important is not whether or not the reversers engaged twelve, ten, or even two seconds after touchdown. Reversers will slice off, at most, 11% of the landing distance on a very wet runway. Other conditions, such as weather and runway contamination (water, oil, etc.) can totally nullify any landing distance reduction from operational thrust reversers. Significant tailwinds, for instance, can increase the landing rollout by as much as 24%. Didn’t any of your pilot sources tell you? Perhaps none of them were rated to fly the A340, were they? So I guess they wouldn’t be able to approximate the landing weight of an A340 flying a transoceanic LFPG-CYYZ route with 309 souls (and luggage) aboard, nor estimate precisely how runway and weather conditions affect the length of the A340’s landing rollout. You know what remedies lack of personal knowledge? Research. Where the hell was yours? You could at least find the last reliable METAR, and figure out how much of a tailwind there was. Would reversers (delayed or otherwise) have made any impact at all, given the late touchdown, tailwind and poor runway conditions? Why did the crew elect to execute an approach when there was significant storm activity on the field? Significant convection activity (like cumulonimbus clouds [CBs] and lightning) are reliable indicators of the presence of wind shear — i.e. rapid wind direction or velocity changes. Wind shear is not exactly a new phenomenon to pilots, especially those with enough experience and training to hold an ATP rating and type-certification on multiple varieties of turbofan-powered airliners. GA pilots are generally advised to stay away from an airport that is showing cumulonimbus (CB) activity within 15 nautical miles of the field. What sort of restrictions or advisements exist for commercial aircraft? Were any of these in effect at the time? What are Air France’s guidelines for approaches into marginal weather. What, if any, are the decision criteria for diversion to an alternate? Newer A340s, like the A340-600, carry enhanced weather radar with predictive wind shear detection capability. These systems warn pilots as much as a minute in advance of expected wind shear activity. Was the A340-313X fitted with these systems, or not? What sort of weather detection capability (besides the aircrew’s Mk I Mod 0 eyeballs) does it have? How would these systems have helped or hindered the aircrew in their decision to divert or execute a full-stop landing? The retired pilot indicates that landing with 40% of the runway behind you is a classic “Don’t do it” situation. The preferred solution to a rejected landing is applying power (TOGA or take off/go around thrust), executing a touch-and-go followed by the missed approach procedure. Since an aircrew cannot see how much runway lies behind them, how do they know how much runway remains in front? At what point does the landing become rejected and TOGA thrust applied? What decision factors lead an aircrew to make this call? Does Air France include these scenarios in routine simulator drill? Do any other airlines? How frequently do they practice it? How many flights, on average, ever execute a touch-and-go? One of the lawyers suing the airline speculates the plane was low on fuel and had to land or risk fuel exhaustion. What is the basis for this claim? Has the lawyer ever heard of a thing called “reserve fuel”? Does the laywer even know the regulations for flight and fuel planning for commercial transoceanic flight? Has Air France or any of its aircrews violated any of these fuel planning or must-divert regulations in the recent past? The Star mentions the loss of the anemometer, which gives wind speed and direction information to air traffic control (and hence also to the pilots). Did air traffic control pass on the anemometer failure to Air France 358, and how would this have affected the aircrew’s land-or-divert decision? What level of equipment failure is sufficient to jeopardise flight safety and/or shut down the runway? What are Air France’s regulations for landing at fields in severe weather that have non-operational weather detection gear? I am just a plebian, non-ATP-rated civilian but I have managed to answer a few of these questions on my own, here on this blog. I could literally write volumes about this stuff. If I somehow — horror of horrors — looked upon blogging as a journalistic effort I might even be motivated to write more, but I’m not paid to do this and frankly the idea of being a reporter does not and never will excite me. I like to do things, not write stories about other guys doing things. Most of my pilot pals fly GA (general aviation), and the commercial guys I know mostly fly Boeings. And none of them work for Air France, so I will never be able to answer all the airline-specific questions. But some folks do get paid to write stories, and among those people are the ones who forgot to ask all sorts of pertinent questions in the course of this so-called investigation. In the Star‘s case, it took not one but three J-school grads to forget or avoid asking all of these questions. Yet they still managed to milk this weak article in a major Canadian daily for a full three pages, and many other media outlets picked it up and ran with it — without asking questions of their own. I stopped reading the Star a while ago, because sometimes while scanning a half-baked, poorly-researched story I could actually feel a net loss of brain cells. News coverage is supposed to inform the public, not make us dumber for having read it. First published 15 September 2005. In the aviation world, the cockpit is often referred to as “the front office”. And just like any ordinary ground-based office, if it is to function well, the people in it need to communicate effectively, with unity of purpose and effort. In the case of Air France 358, it appears that the captain and co-pilot may have had a relatively minor but hugely consequential disagreement during their landing rollout. Montréal radio station CJAD (AM 800) cites an interesting story in Paris daily Le Figaro, “Crash de Toronto: les mystères du cockpit” (poor BabelFish translation to English here). The French newspaper reports it has somehow obtained details of the Air France 358 crash, gleaned from the plane’s FDR (flight data recorder). The crash was previously discussed here in posts “Good Landing?” and “How Long Is Too Long?” The FDR, incidentally, remains in the custody of Canadian officials and they do not expect to publicise the data, along with the CVR (cockpit voice recorder) transcript, until October 4th. According to Le Figaro, the FDR shows that twelve seconds elapsed between AF358’s touchdown and the application of reverse thrust. Normally, reverse thrust is manually engaged by the pilot seconds after an aircraft touches down. The onboard computers have a series of interlocks comparing variables like compression of the main gear struts, wheel rotation speed, throttle setting and radio altitude. When all of these requirements are met, the computer will allow the pilot to move the throttles into the reverse thrust setting. The twelve-second delay is not in itself damning, because thrust reversers do not contribute that much deceleration; the main gear brakes contribute the most to slowing a landing aircraft. If you look at the landing distance modifiers chart below, you can see the effect that the reversers have under various landing conditions. On dry runways, thrust reversers contribute the least amount of braking power (-3% landing distance), because the landing gear wheels have maximal traction and grip on the runway. As runway conditions change and become wet, the wheels have less traction, and reversers contribute more to the deceleration of the aircraft (-7 to -10% landing distance). Under icy conditions, of course, the wheels have very little traction and reversers contribute greatly to aircraft braking (-28% landing distance). What might cause that twelve-second delay? The article says it could be attributable to the pilot (PNF, handling radio communications and FMS) and copilot (PF, landing the aircraft) disagreeing over the proper course of action. The reporter doesn’t say whether this is the case, because the CVR (cockpit voice recorder) transcript has not been released. But I will bet anyone right now that the delay was caused by the aircrew disagreeing over whether to apply takeoff thrust and go around, or apply maximum braking and commit to a full stop landing. That is the sort of decision that needs to be made and executed very quickly and very early in the landing roll, otherwise you will find yourself in a position of having too little runway to safely do either. And that’s when things end badly. Remember how I talked about crew resource management in this post? Good CRM is critical to good flight operations. If one of the flight crew detects something amiss, but doesn’t mention it forcefully enough, or is ignored or overruled by the other pilot, things can go wrong. It is important that both the PF (pilot flying) and PNF (pilot not flying) respect each others’ judgment, and that one unambiguously submit to the authority of the other, even if opinions differ on the proper course of action. Reaching a balance between opinions of two highly-trained, highly experienced pilots, and doing it in a moment’s notice, is tricky work under the best of circumstances. I asked in my original post whether it might have been better to use the adjacent longer (9,697ft) Rwy 24R under low-vis conditions, instead of the shorter (9,000ft) Rwy 24L that AF358 used. According to Le Figaro, Rwy 24R’s ILS (instrument landing system) had been disabled by lightning on the day of the accident. Air France regulations quite sensibly require the aircrew to use ILS guidance under marginal weather conditions, so 24R was not an option. Pearson Tower communicated weather conditions of moderate winds (11kts) to AF358, but the A340’s black box indicates 23kt winds to touchdown. Apparently Pearson’s anemometer and windshear detector were also inoperative that afternoon. No word on whether the Arrivals or Tower controllers were aware of the weather detection problems. The captain’s seat failed (“ruptured” is the word they use) at some point during the crash, and he sustained spinal injuries. Only three years from retirement, he will probably not fly any more. The copilot will resume flying at the end of this month, after a routine simulator checkride. Another problem is that Pearson does not have distance-to-go markers on its runways. These are indicators that tell a pilot how many feet of runway remain in front of him. These markers are standard on U.S. and Canadian military airfields, and many of the United States’ large civil airports, but they are not present at high-traffic civil airports in Canada. Overall it’s not a pretty picture, if all of these unsourced assertions are true. An airport (and air traffic control) whose weather detection capabilities were impaired, and may not have known about it. A key runway unusable because its ILS equipment was disabled. The busiest airport in Canada, without appropriate flight safety markings on its runways. An experienced aircrew that failed, at one of the most critical moments of flight, to commit to a go-around or full stop. I think one can call this as “pilot error” under the circumstances, but note that there were a lot of mitigating factors. Perhaps ATC should have been more circumspect in routing and traffic flow, in light of 24R’s incapacity. Certainly the absence of reliable wind indications and windshear detection should have forced AF358 to an alternate, assuming that ATC was even aware of the problem. The go/no-go decision should absolutely have been made prior to touchdown — AF358 had already floated down 40% of the runway before the wheels made contact. If Pearson had distance-to-go markers on its runways, the Air France aircrew would know whether they had enough room to go around or fully stop. They, in turn, would have less cause for disagreement because numbers would be right there in front of their windshield. Delaying a critical decision for twelve seconds in the rollout might have cost people their lives. We are all are extremely lucky that no one was killed, given the circumstances.